If you are experiencing problems with MHTML format (also known as MIME HTML), you might be looking for a program that can help you view MHT files by means of standard software. Fit-to-page target document, set margins, select quality of output files, etc. All these and other options are accessible via command line. Advanced users are guaranteed to highly appreciate quick access to Total HTML Converter X and its high efficiency. To convert MHT via command line, please, view a full list of commands supported by the converter here. Total HTML Converter X has no GUI and interrupting messages, which makes it ideal for corporate use. If you wish to convert MHT to Unicode text (command line is not used), we suggest that you get Total HTML Converter, a standard version of Total HTML Converter X with intuitive interface and the same options. Check out Total HTML Converter X for free! Download a 30-day trial version of the program now, install it and convert MHT documents into TXT for 1 month absolutely at no charge. This will help you make a competent choice upon the expiration of the trial period. 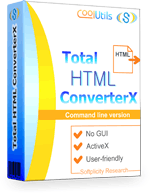 Download Total HTML Converter X today!